Dustin: I live in Florida where few domestic buildings last more than 50 years because of hurricanes. I explored the Monolithic Dome for quite some time. They have stood the test of direct hits by very powerful hurricanes that leveled the entire neighborhood; except the dome. The dome is the only sensible structure here. No other structural shape has ever withstood a Category 5+ Hurricane. EVER. Earthbag Domes seem capable of the same, or close. How can I finish an earthbag dome that won’t erode away in Florida storms? Owen: A lot of people have been impacted by hurricanes, tornadoes and earthquakes. This is something I’ve been working on for years due to the seriousness of the problem. My article on Disaster Resistant Earthbag Housing provides some background information on this issue. Kelly Hart, Patti Stouter and I collaborated on EarthbagStructures.com as an effort to consolidate information on disaster resistant earthbag structures, especially for developing regions. The short answer to your question is to use either cement plaster, or preferably plaster the dome with Portland shotcrete or geopolymer shotcrete. Geopolymer is a natural material (essentially man-made stone) that’s stronger than Portland. The incredible benefits of geopolymer prompted me to start the Geopolymer House Blog, which already has over 140 blog posts. Geopolymer is preferred because it’s stronger and more durable than Portland, although it’s not available everywhere yet and it’s probably more expensive. 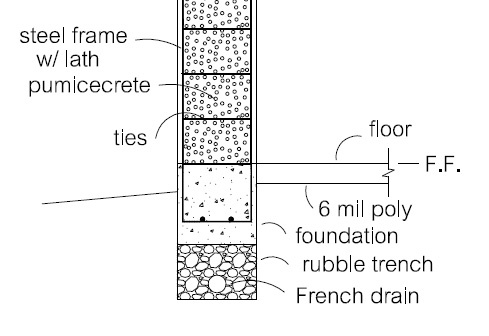 So fiber reinforced shotcrete would be the next best thing. I recommend ferrocement eyebrows over window and door openings to help keep out blowing rain. See Geopolymer Shotcrete on Reinforced Earthbags. Another very similar option is to build a double shell ferrocement dome filled with lightweight insulation. Scoria or pumice would work perfectly for fill material in the core. As explained throughout our blogs many times (use the built-in search engine above to read the details), scoria and pumice are fireproof, rot proof, lightweight, insulating and do not attract insects or pests. Earthbags aren’t necessary. You could pump or pour scoria, pumice, perlite, pumicecrte or perlited cement from above directly into the core. So far no one has built a dome like this as far as I know, even though this building system would create some of the strongest buildings in the world. I’m sure it would work. However, there’s a learning curve to everything and some details would need to be worked out. The end result would be just as strong if not stronger than monolithic concrete domes, and be more durable and more highly insulating. In addition, this design is almost certainly stronger than monolithic domes in seismic areas, because it would more readily flex under extreme loads. Precision Structural Engineering, Inc. is the pioneer of Reinforced Earthbag Building and the only company at this time that engineers and stamps earthbag plans. They’re also expert in ferrocement and can engineer the ferrocement domes that I’m describing here. They have pre-approved my Earthbag House Plans and provide free quotes. They can get code approval in virtually every state as well as many countries. Note the rebar ties that connect the inner and outer rebar/mesh shells. I absolutely love the Earth Bag discussions. I am relatively new to the whole concept but I am excited about putting it into use on my own property. My question to you is this: Is it practical to use in humid zones, such along the Coast lines? The property is 40 acres along the Mississippi Gulf Coast, how well will these do in relative wet areas? Thanks. Poly sand bags were designed for flood control and so they hold up extremely well in moist environments. There’s a Dept. of Transportation study that concluded poly bags will last 500 years or more if kept out of sunlight. You can order their report online. Search our blog for the details.